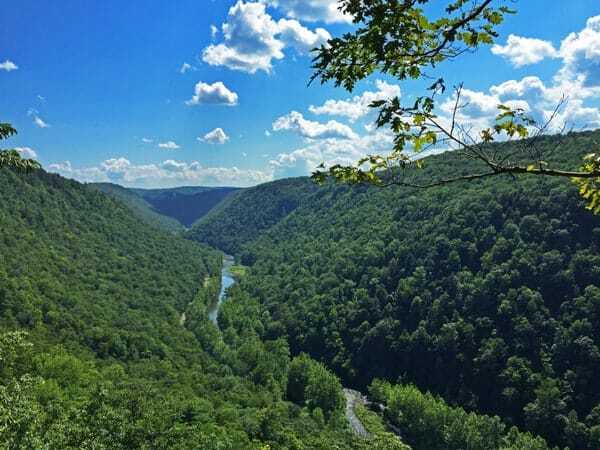 Located in northern Pennsylvania, the Pine Creek Gorge, also known as the Pennsylvania Grand Canyon, is one of the most impressive destinations in the state. Sweeping views and tumbling waterfalls combine with great kayaking, fishing, and trails to make for a dream destination for outdoor lovers. In many respects, if I’m being perfectly honest, I think that the name “Pennsylvania Grand Canyon” is almost a bit unfair to the gorge. 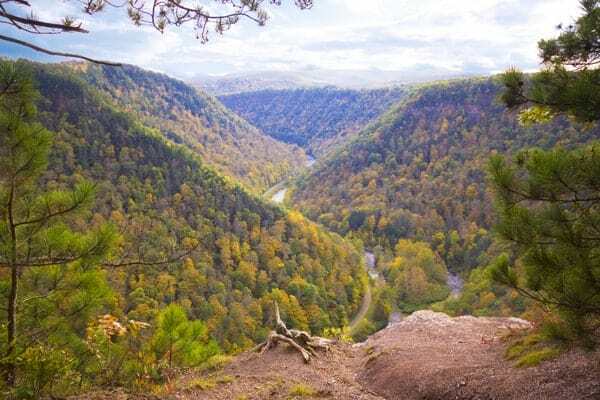 It sets up comparisons to one of the most impressive natural sites in the world, expectations that can’t be met, no matter how amazing Pine Creek Gorge actually is. 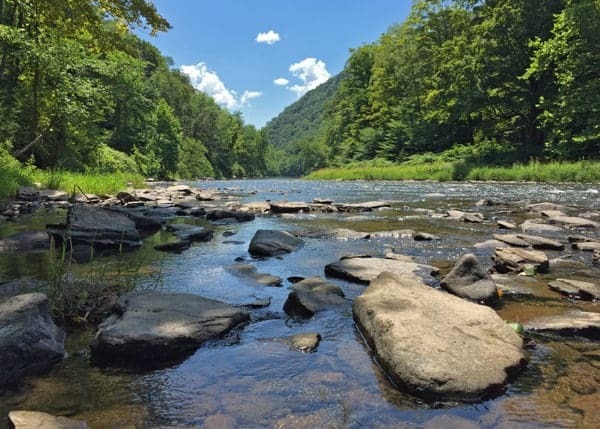 However, whether you call it the Pennsylvania Grand Canyon or Pine Creek Gorge, there is no denying that this is one of the most impressive outdoor destinations in Pennsylvania. The Pennsylvania Grand Canyon from Leonard Harrison State Park. 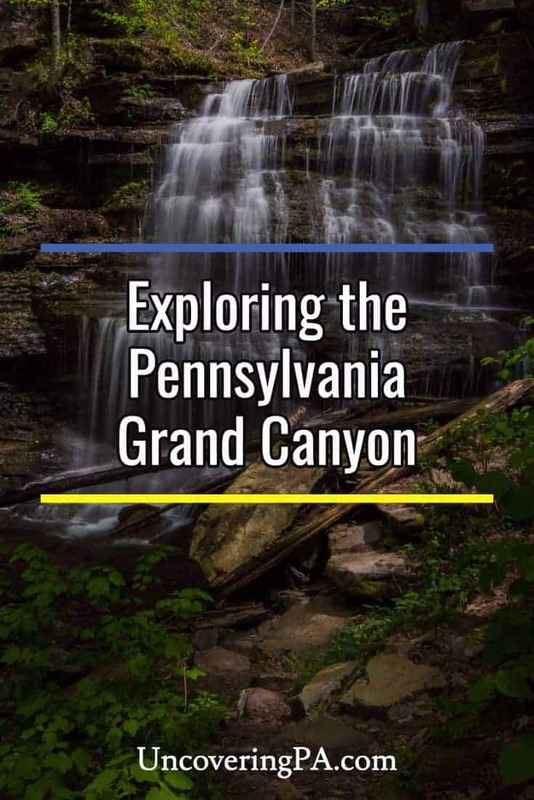 The Pennsylvania Grand Canyon runs 47 miles through Tioga County and Lycoming Counties. 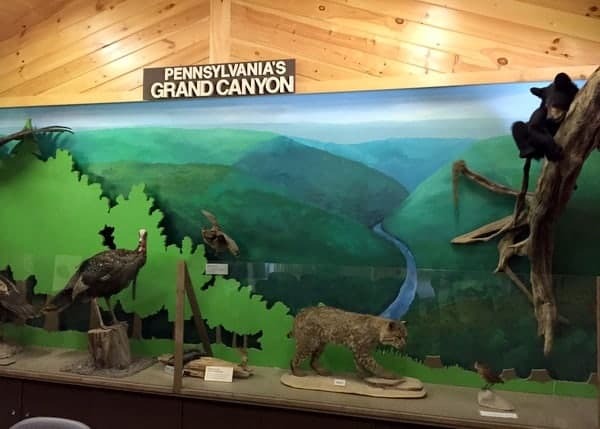 The canyon starts at Ansonia, a small community along Route 6 near Wellsboro, which is a perfect jumping off point for those wanting to visit the northern reaches of the gorge. While little of the area has been tamed or settled, the northern part of the canyon from Ansonia to Blackwell, a distance of roughly 17 miles, is especially remote, with state owned lands surrounding both sides of the canyon. For visitors looking to enjoy the unspoiled beauty of this region, this is the area to visit. Pine Creek makes its way through the Pennsylvania Grand Canyon at the end of the Turkey Path. Much of the land surrounding the northern portions of the Pennsylvania Grand Canyon are public lands, with Leonard Harrison State Park on the eastern rim and Tioga State Forest and Colton Point State Park on the western rim. The eastern rim in Leonard Harrison State Park is the most accessible side of Pine Creek Gorge and closest to downtown Wellsboro. Because of this, you’ll likely find more visitors here than you will on the far side of the PA Grand Canyon. The stars of Leonard Harrison State Park are the views and the waterfalls. The park has an accessible viewing platform less than a hundred yards from the parking area. From here, it’s possible to see 800 feet down to Pine Creek as it passes through the base of the gorge after starting its journey in nearby Potter County. Great views can also be had to the north as the canyon meanders its way through the forested hillsides. Those looking for even more impressive views should take the short, but somewhat challenging Overlook Trail to Otter Point, which offers views south that are even more impressive than those at the main viewing area. This trail also takes visitors past the remains of an incinerator that was part of the CCC’s work at the park in the 1930s. 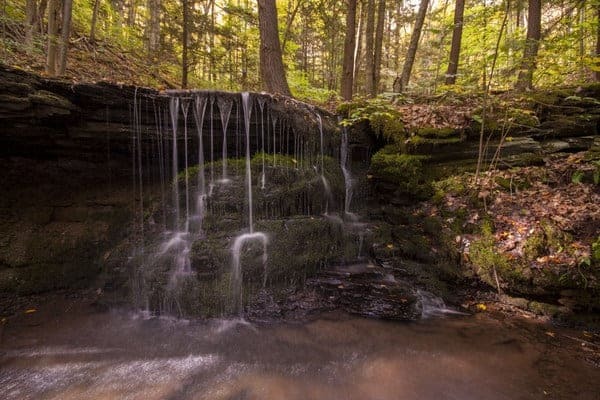 Those looking for a challenging hike will be well rewarded with the Turkey Path, a four-mile roundtrip trail that passes cascading waterfalls on its way to the bottom of the gorge. Despite both stairs and switchbacks, I have to say that this might be the most difficult trail I’ve done in Pennsylvania. So, while it is beautiful, make sure you are in decent shape before tackling this trail. Roughly halfway down the Turkey Path, the trail meets up with Little Four Mile Creek. The creek cascades down through a series of waterfalls before emptying into Pine Creek at the base of the gorge and the end of the Turkey Path. This is also where the Turkey Path meets the Pine Creek Rail Trail, a 65-mile trail that runs from north of Wellsboro and through the Pennsylvania Grand Canyon to the Susquehanna River in Jersey Shore, PA. This is a popular walking and biking trail, and if you visit on a beautiful day, you’ll likely see people utilizing this trail. 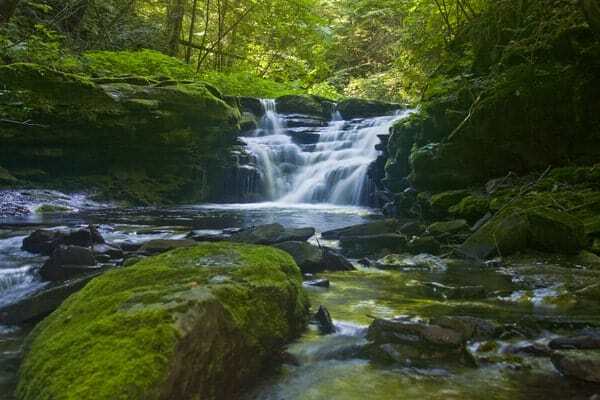 If you happen to be one of them, a short, but steep mile-long hike up the trail will give you access to the waterfalls of Leonard Harrison State Park. 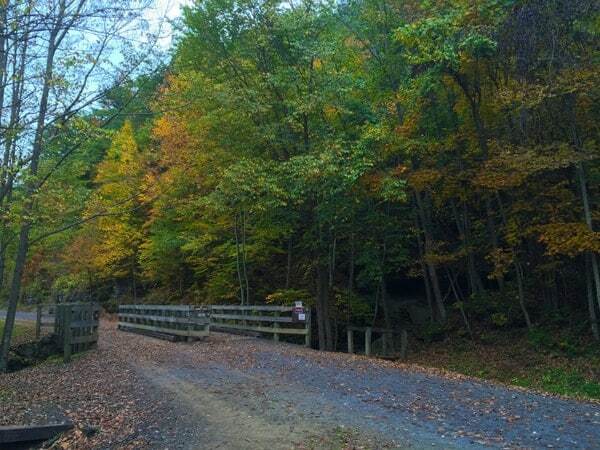 The Pine Creek Rail Trail at the bottom of the Turkey Path in Leonard Harrison State Park. Back up at the top, make sure to check out the small gift shop and museum in the park’s visitor center. This is a great area to pick up a souvenir and learn a bit more about the area. During the warmer months, there might also be food vendors here for those looking for a snack or meal. There is a small museum at Leonard Harrison State Park that’s worth seeing. On the western rim of the Pennsylvania Grand Canyon, 4,000 feet away from the overlooks at Leonard Harrison State Park, is Colton Point State Park. This side of the park is much less developed than the eastern rim, with a well-maintained dirt road traveling the four miles back to the park’s entrance. However, those that make the journey to this side of the canyon are rewarded with some of the most breathtaking views, as well as hidden waterfalls that make the trip well-worth taking. The western side of the Grand Canyon is home to the West Rim Trail, a 30-mile trail that runs along the gorge’s edge. Even if you don’t hike the entire trail, the portion of it that runs Colton Point State Park offers fantastic views of the Pennsylvania Grand Canyon. There are several vantage points marked on the park map that offer amazing views of the canyon, and if you look closely, you can see the viewing area of Leonard Harrison State Park on the opposite rim. Another popular trail in Colton Point State Park is the Turkey Path (which is not to be confused with the Turkey Path on the other side of Pine Creek Gorge). This 3-mile trail is extremely difficult, though not quite as difficult as the one in Leonard Harrison. Along the path, there is a roughly 75-foot waterfall along the Rexford Branch. The upper portion of this waterfall can be seen from the trail, and the lower portion (which is the main drop), can be seen from an unmarked trail that goes straight when there is a turn in the second set of switchbacks. The upper portion of the main waterfall along the Turkey Path in Colton Point State Park. There are also waterfalls near the trail here on Four Mile Run, but they can’t easily be seen from the trail, making a bit of off-trail Pine Creek Gorge hiking necessary. Getting to these waterfalls can be quite difficult and should only be attempted by experienced hikers. 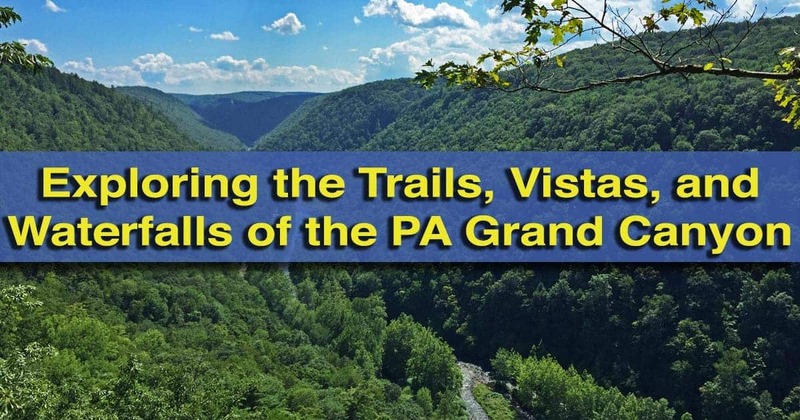 That shouldn’t discourage you from hiking the Turkey Path, however, as it is a nice piece of PA Grand Canyon hiking. A small waterfall along Four Mile Run in Colton Point State Park. Just outside of Colton Point State Park in Tioga State Forest are several other highlights of the area. These both are actually before the park, if you are coming from Route 6. The first is Barbour Rock, probably the best vantage point from which to view the Pennsylvania Grand Canyon. This handicapped-accessible trail is roughly 1.5 miles roundtrip along a wide, level path. 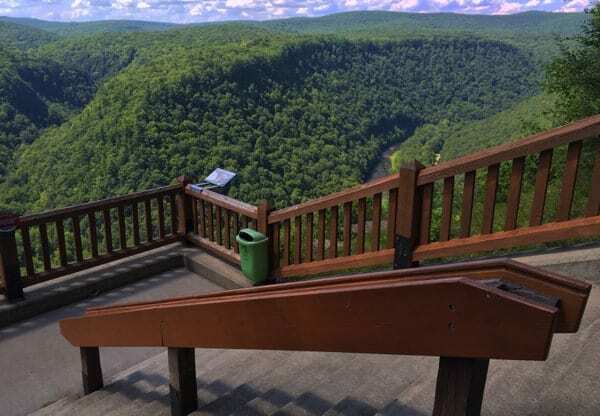 The viewing platform above Barbour Rock offers sweeping views south along the Pennsylvania Grand Canyon and shouldn’t be missed. The creeks just outside Colton Point State Park feature several great waterfalls. 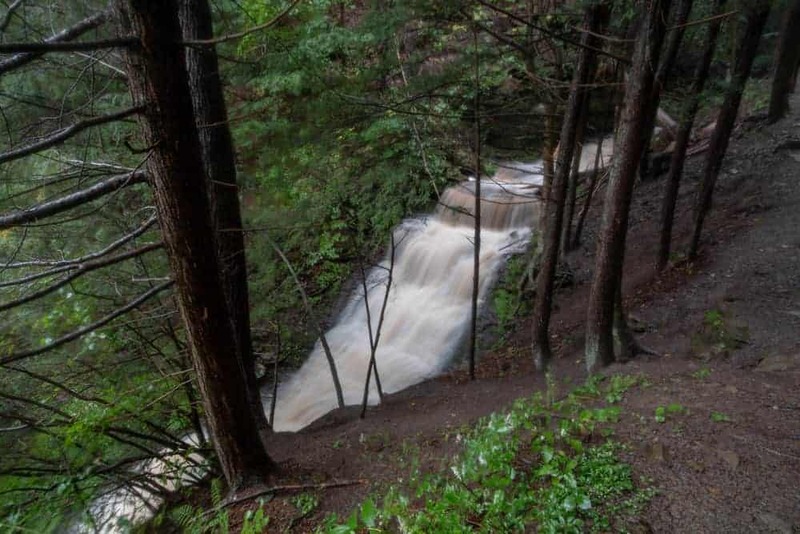 Keep in mind, however, that these creeks have no trails and require significant precautions if you’re going to attempt to see these waterfalls. 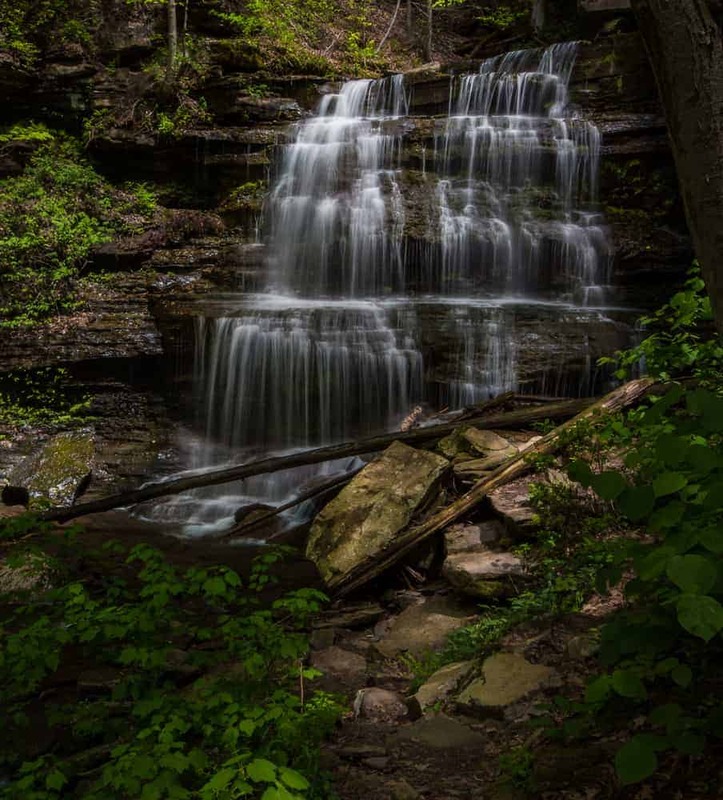 Should you be an experienced hiker and want to see them, my friend Rusty Glessner has put together a great guide to the waterfalls of Bear Run and Chimney Hollow Falls. One of the waterfalls on Bear Run along the edges of Colton Point State Park. 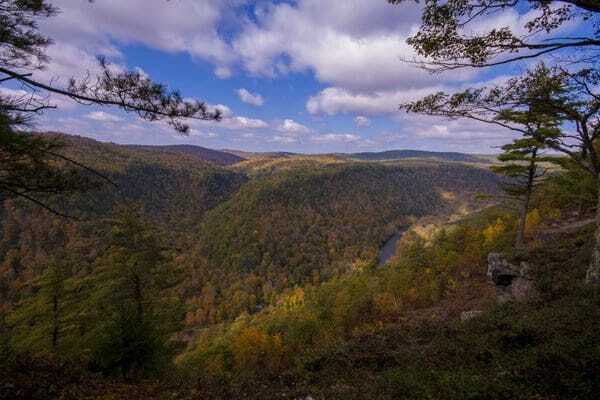 Without a doubt, Pine Creek Gorge should be on the Pennsylvania bucket list of any travelers in the state. The amazing vistas, towering waterfalls, and endless opportunities for outdoor adventure shouldn’t be missed. 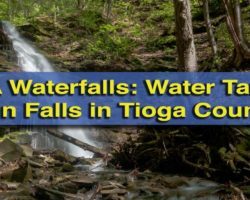 Looking for other great waterfalls in Tioga County, PA? 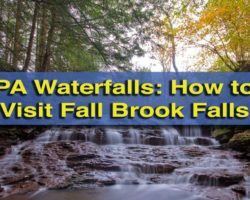 Check out Sand Run Falls in Tioga State Forest, Water Tank Run Falls along the Pine Creek Rail Trail, and Fall Brook Falls. I am travelling from Philly to Pitt and was hoping to make it a scenic drive; however, it looks at those Colton Park is pretty far north. 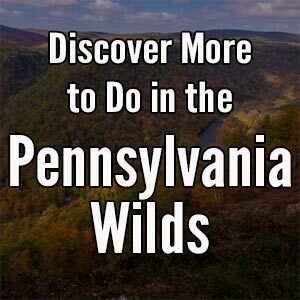 Is it worth traveling to the southern most point of the Pine Creek Gorge? Or do you have any other recommendations for stops between Philly and Pitt? I would say that anything from Slate Run up is definitely worth the detour. 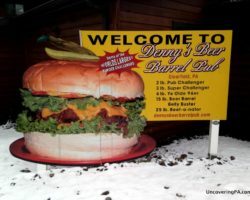 For other suggestions around the state, check out our Pennsylvania Travel Map, which features all the places written about on UncoveringPA: UncoveringPA.com/Pennsylvania-Travel-Map. Are there any tour operators that offer overnight hiking tours for the Grand Canyon, PA ? I’m about an hour away . Nice day trip. Best fall colors too. We will be coming from Washington DC and heading by car to Niagra Falla, Canada on October 10-17. Ending back in Baltimore On the 18th with a two day stay at Niagra Falls. 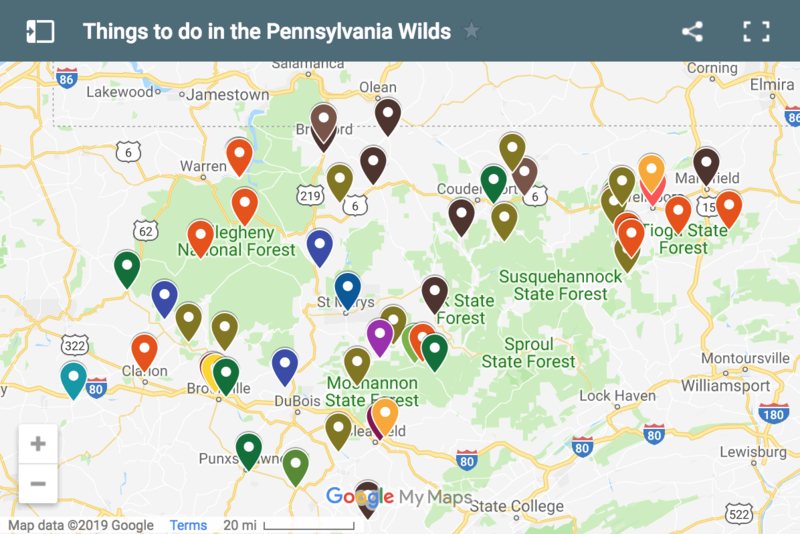 I am seeing sooo many places to visit but we only have about 5 or 6 days in PA. I want to see as much beauty as I can. I love the changing colors and want to see the best of PA. I Have read so much and want to see it all but I know it can’t be done so I want the best places to go. Can you give me your top places to visit in October? I’d stick to the northern portion of that state during that time frame. The Pennsylvania Grand Canyon and Kinzua Bridge State Park would probably be my top two picks that in that area. Drive Route 6 between them, which has a lot of stops along the way. The Delaware Water Gap, which is further east, is also great, but definitely won’t be near pick at that point. Hope that helps a bit. Thank you so much for your help. We are looking forward to our trip! The vista at Leonard Harrison State Park is definitely doable. Barbour Rock is a flat trail, but it’s at least half a mile one way. If you can make it, it’s definitely worth it. Thanks, Jim. I was also wondering about sunrise or sunset opportunities. Is the light best early am or late pm? It depends on which side you are on and what type of sunrise and sunset shots you are looking for. Leonard Harrison sits on the eastern rim of the canyon and Colton Point is on the western side. Hope that helps. How should I set my gps for these locatiions and also Barbour Rock? Thanks. 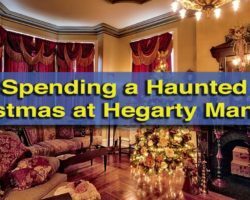 Are these area accessible during this time of year? Depends on the amount of snow and what you consider accessible. I believe the closest road should be generally open. The trail may be covered in snow as it’s a popular area for cross-country skiing. If you can make it through the snow on the trail, you should be able to make your way up to the falls. Just be cautious for ice close to the falls. How difficult would you say this hike truly is? We hike frequently in Centre and Blair counties, state parks like Black Mo and Canoe creek mainly. We’re in decent shape and have a young son who we carry in a Kelti backpack. Would it be fairly doable? I love waterfall photography and want to try to get a few shots while we’re there in late June. And I’m friends with Rusty Glessner, too. 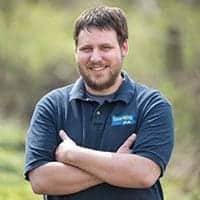 Nice shoutout to him in your article. It’s definitely doable. Worst case scenario you have to stop a few times on the way up to catch your breath. It’s not really a dangerous trail, just pretty steep. We are going to do a 3 night backpacking trip through the grand canyon. Our first time visiting. Hoping to do some side trails also. Is there any designated tent spots? Do we have to register? Your best bet is to contact the state forest. I’m not familiar with the rules for camping in that area. If taking the Barbour Rock trail, can you switch over to the Bear Run trail and see the waterfalls? There really isn’t a trail along Bear Run. More of a bushwhack and stream walk than anything. However, you could take the West Rim Trail over to the creek from Barbour Rock if you wanted, but it would be faster to two them as two separate hikes. The Bear Run Trail runs along the portion of the creek west of the main road into Colton Point State Park. All of the waterfalls are east of the road where it cascades into the canyon. I’ve been down the creek (not as far as Rusty, though), and it’s quite beautiful, but also fairly difficult hiking to get to the bottom of the falls.